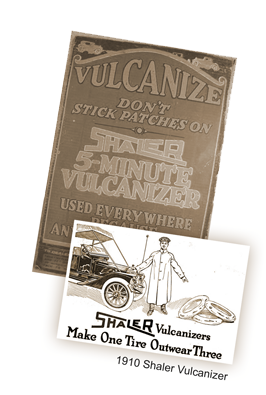 At the turn of the century, Shaler introduced two highly innovative products into the automotive industry; the Shaler Vulcanizer and the Shaler Roadlighter. Both inventions bestowed pioneering technology unto the public and were met with overwhelming success. The Shaler Vulcanizer revolutionized the tire repair industry as a profitable, easy to use, tire tube patching machine. The larger versions of the Vulcanizer were primarily used in service stations and were offered in three types. The Shaler Vulcanizer so significantly increased tire repair shop output that it grew the Shaler name into a reputable leader of the vulcanizing field, doubling their production by 1918. A more compact style – the five-minute vulcanizer – was later developed and promoted directly to motorists for quick tire tube repairs. Any motorist simply had to apply the resourceful hot or cold patch to the puncture in the tube and ignite it with a match. As the contained disc of prepared solid fuel burned, it generated enough heat to cure the patch directly to the tube, sealing it completely and allowing motorists to continue on their way. 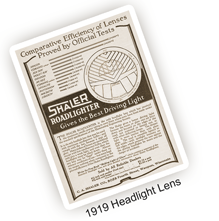 Another ingenious product developed by Shaler was the Shaler Roadlighter, a headlight lens that transformed the market. When headlight laws regarding necessary brightness varied throughout the States, the Shaler Roadlighter was the first headlight lens that received the maximum candle power rating in every State where tests were made under the standard specifications of the Illuminating Engineering Society. The Roadlighter lens eliminated all glare from the headlight by bending the rays of light via prisms so that the roadway was smoothly lighted, with spotlight intensity focused on the edges of the road. This drastically improved visibility and overall driving safety as the light could not reach the level of the approaching driver’s eye, reducing the dangers of accidents on the road. The Shaler Roadlighter lens could be used with any style lamp bulb, did not require accurate focusing and was manufactured to fit all make and model vehicles. Since the foundation of the Shaler Company over 100 years ago, Shaler has created stop leak solutions for nuclear submarines, locomotives and many other industrial applications. One of the newest innovations by Shaler is the affordable, safe and environmentally friendly resolution to the widespread problem of under-ice coolant leaks; Rink Seal Pro. Formulated to save the bottom line of any ice arena, Rink Seal Pro is specifically designed to be directly added to any coolant system and stops leaks in polyethylene plastic, copper and steel piping yielding visible results in as little as one to two days. When you choose Shaler, you’re not just choosing a product, you’re choosing over 100 years in stop leak expertise.